Radio Host – Is Flooding God’s Judgement on Texas “Sodomites”? Radio Host Bryan Fischer thinks it’s a reasonable hypothesis. More research needed. Go ahead and laugh. This is only going to get louder as things keep changing. 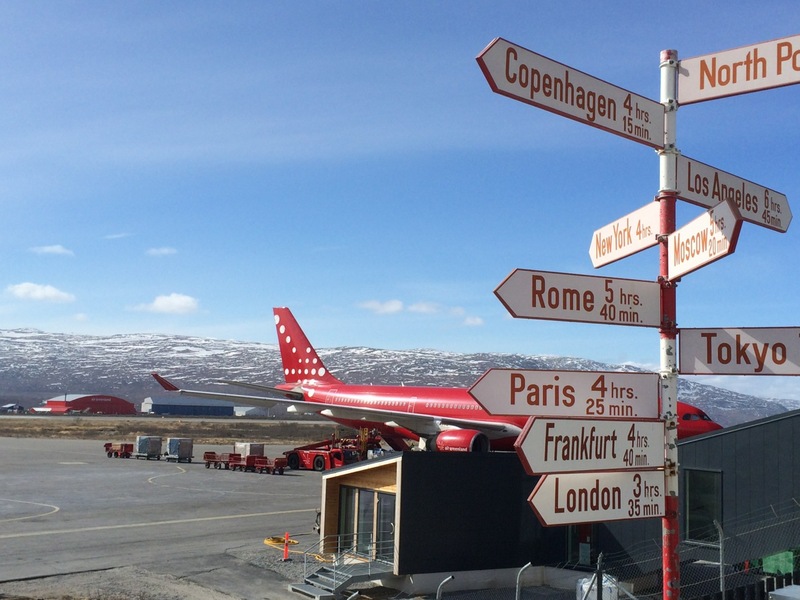 I’m sitting in the cafe at the airstrip in Kangerlussuaq, the main port of entry for most folks coming in to Greenland. I believe this is the only place with daily, year round service from Europe – a single “Mothership” Airbus 330, making the run daily from Copenhagen. There’s a lot of patchy snow in the vicinity – forgot May is still pretty cold here, having come from blossom time in Scandanavia. I immediately ran into microbiologist Marek Stibal, who is already here camping not far away, taking sediment samples to flesh out the picture of biological activity on the ice. LUCKNOW: The intense heat wave condition that is sweeping across India currently could be another manifestation of an extreme weather event, said researchers from the New Delhi-based research and advocacy organisation, Centre for Science and Environment (CSE), in a statement on Thursday. About 2,000 people have been killed in India by this weather condition. 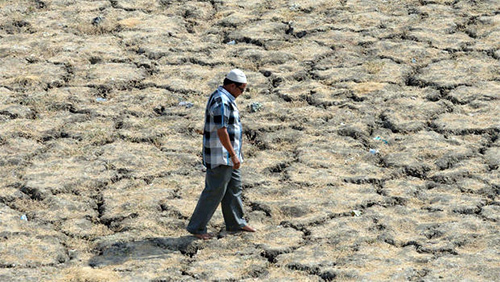 In the worst-affected states of Andhra Pradesh and Telangana, maximum temperatures have hovered around a searing 45 degrees Celsius. Climate records show that human-induced global warming had turned 2014 into the hottest year on record. Eight out of the 10 warmest years in India were during the recent past decade (2001-2010), making it the warmest decade on record with a decadal mean temperature anomaly of 0.49 °C. CSE climate researchers say more heat waves were expected as globally temperatures had risen by an average 0.8 degrees in the past 100 years. Night-time temperatures are rising too, with Ahmedabad and Delhi recently reporting 39 and 36 degrees centigrade. “The number of heat wave days may go up from about 5 to between 30 and 40 every year,” they add. Surfaces of some roads in Delhi have melted in the sun, twisting the paintwork of pedestrian crossings into unusual patterns. Houston Sees 500 Year “Flash Flood Emergency”. India Roasts. 500 Year Floods aren’t as unusual as they used to be. In India, Spring Heat wave melts roads and claims lives. Meanwhile, 2015 seems on track to erase 2014 as the hottest year in the modern record. And though the rise in the last 10 years has been gentle by comparison, since 1910, the clear trend has been up,according to NASA’s Global Land-Ocean Temperature Index. “The average Arctic sea ice extent for March was 430,000 square miles (7.2 percent) below the 1981–2010 average. This was the smallest March extent since records began in 1979,” NOAA said. On the other end of the globe — in the Antarctic — sea ice has been on the gain, and this year, it hit a record March high. But globally, the overall result is a big net loss. “The upward trend in the Antarctic … is only about a third of the magnitude of the rapid loss of sea ice in the Arctic Ocean,” according to NASA. From the series of interviews that now make up John Cook’s Massive Open Online Course (MOOC) on understanding, and confronting, Climate Denial. Since “Frankenstein”, a consistent theme in speculative fiction has been the technological leap that turns on mankind. Since the advent of the nuclear age, that theme is not only credible, but obvious. Two of this summer’s biggest movies so far are “The Age of Ultron”, where the villain is a runaway artificial intelligence, and the Mad Max sequel, “Fury Road”, set in a climate altered future. “Fury Road” has been particularly well reviewed, with a spectacular 98 percent rating on the “Rotten Tomatoes” website. It felt very grounded in real events. The idea of globalization and global warming and drought and the value of water, and leadership becoming completely out of hand.
. . . there are images on Google right now of Sahara desert sand being blown, in that state, all through Africa. And that’s frightening. The hair lifted up on the back of my neck. What makes [the film] even scarier is that it is something that is not far off if we don’t pull it together. (The far right news site) Breitbart is alarmed about the cli-fi trend. The recent election results in Alberta were a shock to the Canadian Oil patch, including bigwigs in charge of the planet-killing Tar Sands extraction projects underway there. Add in to that the Pope’s eminent “encyclical” letter that will make climate change a priority for the world’s 1.2 billion Catholics, and you understand why Oil giants are scrambling to find an alternative to stone walling on climate change solutions. I’ve posted on the recent declarations by executives at BP and Shell in regard to climate and a carbon tax. Last week, Steve William, CEO of Suncor, one of the biggest Tar Sands players, declared that climate change was real, could not be ignored, and invited the new Alberta Government to come up with a carbon tax plan. Belatedly, the Wall Street Journal has sniffed out a trend.